Twentieth Century Fox has launched an alien-themed virtual reality (VR) experience in Regal Cinemas in the US. Unveiled last week (4 May) in select Regal locations, the VR experience is titled 'Alien: Covenant In Utero' and is being showcased in 15 different cities, inviting guests to immerse themselves in an alient-themed gaming experience. Alien: Covenant, from director Ridley Scott and distributed by Twentieth Century Fox, will arrive in Regal Cinemas across the country on May 19. Produced by Ridley Scott and directed by David Karlak, 'Alien: Covenant In Utero' is a 360-degree virtual reality journey into a living nightmare that offers a terrifyingly close and personal encounter as an alien Neomorph at the time of its birth. Fans will be able to experience the world around them and relive the very first memories of the Neomorph in an immersive environment. Zachary Eller SVP marketing partnerships at Twentieth Century Fox said: "Our goal at Twentieth Century Fox is to create incredible cinematic experiences. 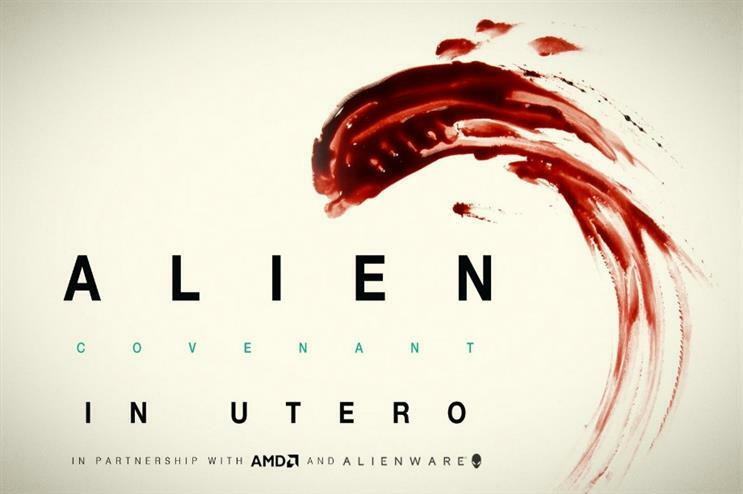 Partnering with Regal, AMD and Alienware on touring the Alien In Utero VR experience allows us to make sure the cinematic experience starts even before the movie begins." The traveling event will run in select Regal Cinemas from until June 4. The theatres will feature several Oculus Rift demo kiosks where viewers can immerse themselves in the powerful content before or after their movie. Each of the kiosks will be powered by Alienware Aurora PC's, which are designed for virtual reality. The tour will run across a number of US cities, including Houston, Boston, New York, San Francisco, Chicago, Washington and Seattle. In January, video games publisher Capcom launched an immersive Resident Evil experience in London's East End, to celebrate the launch of the newest game in the franchise, Resident Evil 7 Biohazard. Last month, McLaren and the Digital Engineering and Test Centre (DETC) teamed up to stage an activation at the Virtual Reality Show.